The majority of historical and heritage structures around the world consist of unreinforced masonry walls. A masonry structure is composed of masonry units, such as brick or marble blocks, with or without a joint filling material, such as mortar. A masonry with a joint material is usually made of two different materials (i.e. masonry units and mortar), representing a non-homogeneous and anisotropic structural component. In other words, masonry is a discontinuous structural component whose deformations and failure mechanism are governed by its blocky behavior. Some ancient masonry structures, such as ancient columns and colonnades, are constructed without any form of joint material between the individual blocks. Therefore, the isotropic elastic continuum-based models are not suitable for the simulation of the real nonlinear behavior of masonry walls under applied load. Numerical modeling and analysis of masonry structures is one of the greatest challenges faced by structural engineers. This difficulty is attributed to the presence of joints as the major source of weakness, discontinuity and nonlinearity as well as the existence of uncertainties in the material and geometrical properties. A suitable numerical model must take into account two types of structural behavior: (1) behavior of masonry units (i.e. bricks); and (2) behavior of the joint material (i.e. mortar). In the case of ancient masonry structures without any joint material, the numerical model should be able to take into account complicated rocking and sliding of the individual blocks, which may arise during dynamic loadings, such as earthquake excitations. Numerical modeling strategies of masonry structures are divided into two distinct categories; micro-modeling and macro-modeling. In macro-modeling, a masonry element can be represented using a continuum homogenized model, usually with the finite element method, considering implicitly the effects of mortar joints. In micro-modeling of masonry elements with joint material, the interaction between masonry bricks along the joints is taken into account explicitly using interface elements and utilizing a numerical model such as discontinuous finite element models (D-FEM), discrete/distinct element methods (DEM), discontinuous deformation analysis (DDA), particle flow code (PFC) and finite-discrete element model (FDEM). In the literature, there are extensive researches on the numerical modeling and analysis of masonry structures with their particular advantages and disadvantages. In this chapter, a thorough overview of the different numerical models proposed for the analysis of masonry structures is presented, while the advantages and disadvantages of each model are pointed out. Furthermore, some comparative studies available in the literature are presented to identify the capabilities and limitations of each computational model introduced throughout this chapter. Finally, some of the general-purpose and specialized finite/discrete element commercial software packages available for numerical modeling and analysis of discontinuous masonry structures are introduced and their advantages and disadvantages are discussed. Historic structures can be defined as “existing structures with significant cultural value to the society”. They can be buildings, towers, bridges, etc. They are mostly made of masonry and timber, sometimes with elements of steel, iron or even concrete (for the more recent constructions). Developed societies ascribe cultural significance to these structures, which are perceived as cultural heritage to the society. Cultural significance means the importance of a site or structure as determined by the aggregate of the values attributed to it. The values considered in this process include those held by experts – the art historians, archaeologists, architects, and others – as well as other values brought forth by new stakeholders or constituents, such as social and/or economic values. Existing structures and buildings are subjected to the process of degradation with time, which leads to a situation in which they become unable to fulfill the purpose for which they were built. Sometimes, there is also a need to improve the conditions offered by existing buildings or to adapt them to new functions. Furthermore, despite living in an environment of rapid technological evolution, as the society progresses, people realize the necessity and responsibility to maintain the existing architectural heritage and pass it on to future generations. Degradation of historic/heritage structures made of masonry can occur in different ways. Earthquakes constitute a significant cause of degradation. Any major earthquake can result in losing a number of historic structures. 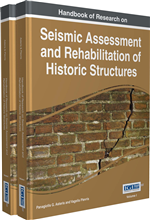 The seismic assessment and rehabilitation of heritage buildings and monuments has become an issue of great importance around the world today. It is the consequenceof the desire to improve existing buildings for adverse conditions, and also of the recognition of the importance of the conservation of our architectural heritage. Rehabilitation of masonry buildings comprises a way of sustainable development and also an act of cultural significance.